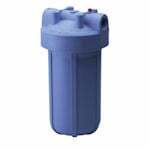 The Pentek, Ametek, US Filter 10" Big Blue HFPP (High-Flow, PolyPropelene) 1" Housing is a heavy duty filter housing with pressure release valve. 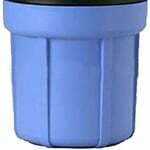 The Pentek, Ametek, US Filter 10" Big Blue HFPP (High-Flow, PolyPropelene) 3/4" Housing is a heavy duty filter housing with pressure release valve. 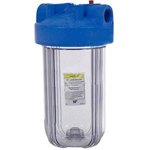 The Pentek, Ametek, US Filter 10" Big Blue HFPP (High-Flow, PolyPropelene) 1.5" Housing is a heavy duty filter housing with pressure release valve. 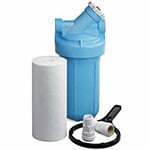 The Pentek 153029 big blue housing is compatible with your standard 10" filter. 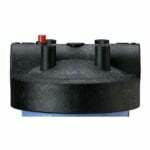 This filter sump will fit housings uses 5 3/4" diameter big blue O-rings. 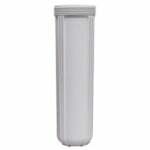 The Pentek 166219 1" #10 Big Clear Housing can be used in a variety of applications to meet your filtration needs. Also known as 10" Big Clear. Features 1" FPT connections. 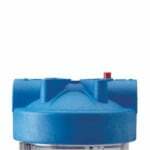 The Pentek 154077 Big Blue Housing 1" Filter Cap is a filter housing cap that fits Big Blue housings. 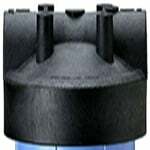 This replacement filter cap features a 1" NPT inlet and outlet port and a 1.25" internal port that promotes the flow of a higher volume of liquid. 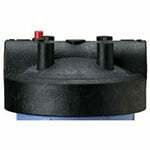 The Pentek 154078 high flow polyproylene cap is a filter housing cap for your Big Blue housing. 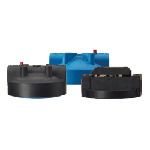 This big blue housing cap is a black cap with a 1.5" inch NPT inlet and outlet port. 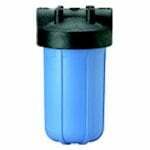 This Pentek 153098 10" Big Blue Filter Housing Sump, aids in quality filtration. 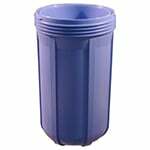 This Pentek Big Blue Filter Sump comes with a 3/8" NPT Drain Hole. The Pentek, Ametek, US Filter 150238 10" Big Blue HFPP (High-Flow, PolyPropelene) 1" Housing is a heavy duty filter housing. The Pentek 150240 1 1/2" Big Blue 10" Filter Housing is an extra-wide housing that accommodates large 4 1/2" wide filters for increased flow. The Pentek 154166 is the correct replacement for the following selected filter housings: Pentek, Culligan, American Plumber and Ametek. This Pentek 154167 1.5" Cap for Big Blue Filter Housing has 1.5 inch NPT inlet and outlet ports. 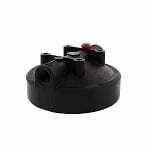 This Pentek housing cap is also equipped with a red pressure release button that can be used for optional pressure relief or bleed. 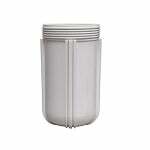 This Pentek 153163 10" Big White Filter Housing Sump is white in color. The Pentek Big White Housing Sump is manufactured from reinforced Polypropylene that ensures durability and longevity. The Pentek 154299 is a 1" Big White Filter housing cap. This white cap will fit on your 10" housing. 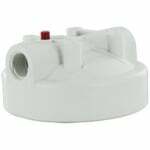 This cap for your big white housing features a pressure release valve for easy installation. Special Order. Ships in 67 days.